In examining a forum that discusses common core math, I noticed that there are alot of complaints about common core math and aligned tests. I’m writing because in the just released EngageNY 6th Grade Common Core Math Exam sample questions, there is a serious conceptual error in the explanation for what constitutes a correct answer to a question about equivalence of algebraic expressions with terms x,y,z on p. 87 of the 6th grade downloaded file. You can access the file from the chalkbeat website found at the end of the post, but I’ve attached a pdf of an excerpt. 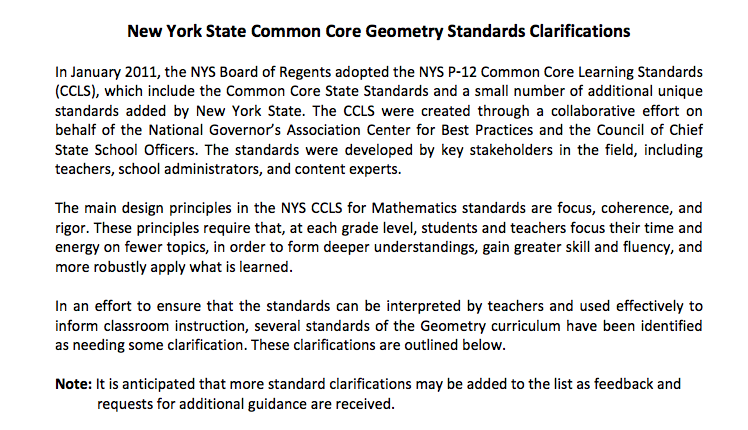 I’m not a math teacher, but I hope that the math teacher community can reach out to Pearson or NYS to address this. 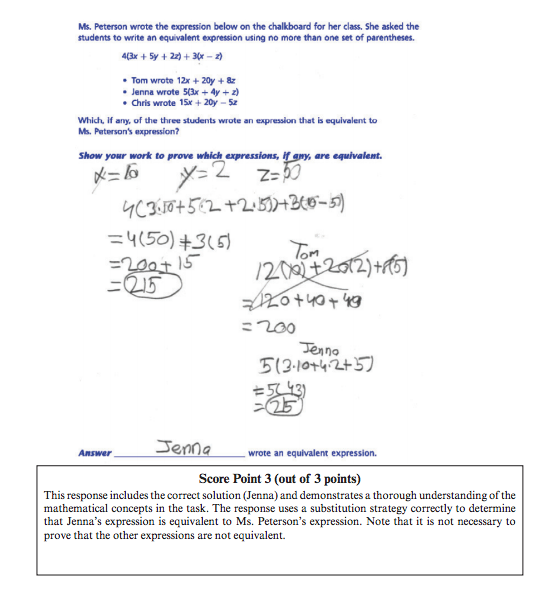 On p. 87, you will see that credit is awarded if a student substitutes randomly selected values and decides that two algebraic expressions are generally equivalent based on the particular substitution. This rationale is erroneous as it only proves the intersection of the expressions at that particular value, and says nothing about other possible values of x,y,z. In other words, evaluating expressions for equivalence by substituting an arbitrary value doesn’t consider the chance intersection of different expressions at a single point, and is therefore an invalid approach. For example, the substitution of the values 1,1,1 would lead a hapless confused student to the erroneous conclusion that three of the expressions are equivalent. 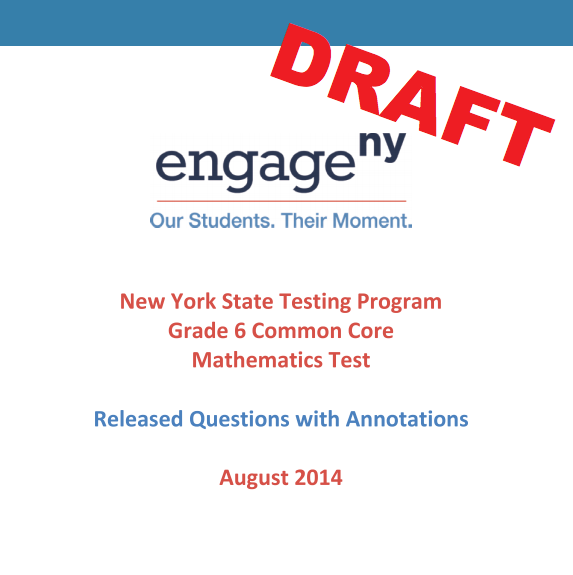 I’m not attacking CommonCore, but I think there is a real story about test writers seemingly not understanding the underlying content of the material they are testing, as well as the aggravating factor of the time crunch to publish these tests. I hope that Pearson’s curricula doesn’t teach this method to 6th graders as a strategy, but I given the demands for increasing alignment between teaching and assessment, I worry that they might. 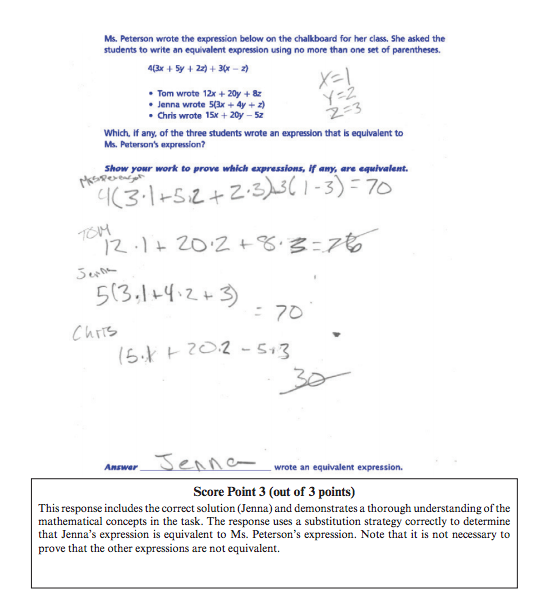 The most worrisome big picture concern for me is that in an attempt to increase students’ understanding, the curricula may be shifting towards cramming more algorithms (here substitution, to be used only as a non-determinative check) and neglecting to fully teach their correct and incorrect application. name the same number regardless of which number y stands for. Herein lies my main beef with the Common Core standards, namely that the meaning of each standard and how one could possibly assess that standard are not at all clear. Even the test writers don’t understand the standards! Certainly it is worthwhile and enlightening to demonstrate that for any y value anyone wants to choose that y + y + y = 3y. However, this is a plausibility argument and not a mathematically valid justification or explanation for why y + y + y = 3y. It’s very sad that the explanation given would be acceptable for full credit, and shows yet again that Albany is incompetent. You are absolutely correct that you can not prove equivalence with substitution, but you can prove that two expressions are not equivalent with substitution. I think that combining like terms with multiple variables and the distributive property is a pretty tough concept for most 6th graders. I would have liked the question and answers better if they directions had said that only one of the other expressions is equivalent. Then a student who showed by substitution that two of the expressions were not equivalent would deserve full credit for identifying the equivalent expression. From the Pinepple and the Hare, there have been many instances of poorly worded and flawed tests. 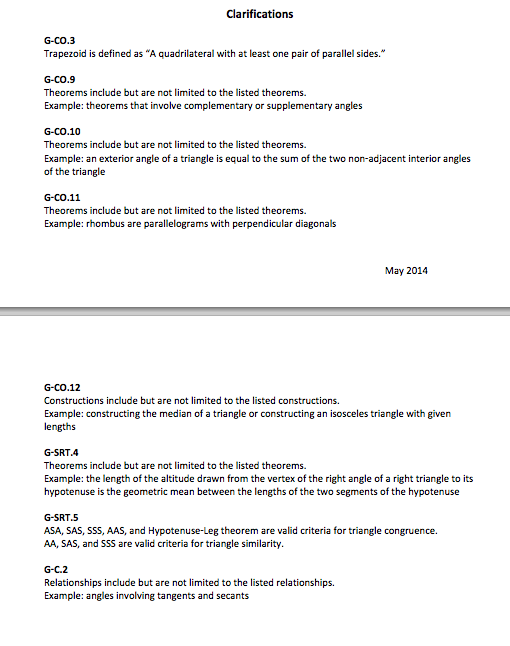 In addition, in order to align to the common core, key foundational concepts and definitions of math are being changed. Many of these changes run contrary to what the balance of the world is doing and understand.. According to the teachers above, test writers seemingly do not understand the underlying content of the mterial they are testing. Students are being tested with questions that are wroung, easily impeached and definitions are being changed which may fly in the face of definitions and concepts taught in the rest of world. That SED subjects students to tests with seriously flawed and confusing exam questions is compounded by the fact that the state has tied accountability measures to these flawed tests. This reality is truly abhorrent.